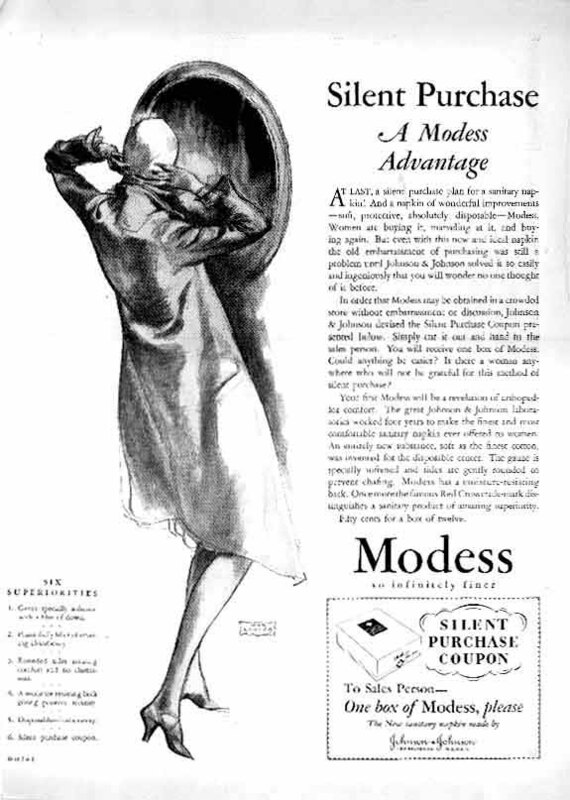 Other Modess ads: another from 1928, 1931,"Modess . . . . because" ads, the French Modess, and the German "Freedom" (Kimberly-Clark) for teens. Ads for the Kotex stick tampon (U.S.A., 1970s) - a Japanese stick tampon from the 1970s. Many women were, and still are, embarrassed to buy menstrual products. 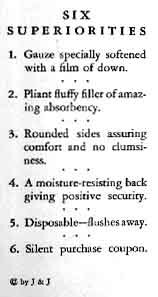 One way companies devised to overcome this was to offer notes to give to sales clerks, the "silent purchase" of the ad below. A writer to MUM said that companies used this method also during World War II. The German company that sold Camelia pads (scroll to bottom of that page), the second disposable pad in that country (see an ad for the first), until about 1950 put a slip of paper into each box of pads asking the clerk to sell this person a plainly wrapped box of Camelia. And a sign in stores told customers to ask a female clerk for the pads. Mail-order catalogs, like Sears, Roebuck in the U.S.A., provided another way for women to buy menstrual products without embarrassing themselves, and promoted this fact (see an ad for the 1930s tampon Wix). Readable enlargements of the words of the ad appear below the first picture. and the German "Freedom" (Kimberly-Clark) for teens.